Figure 45: Two inductively coupled circuits. It turns out that a henry is a rather unwieldy unit. The mutual inductances of the circuits typically encountered in laboratory experiments are measured in milli-henries. 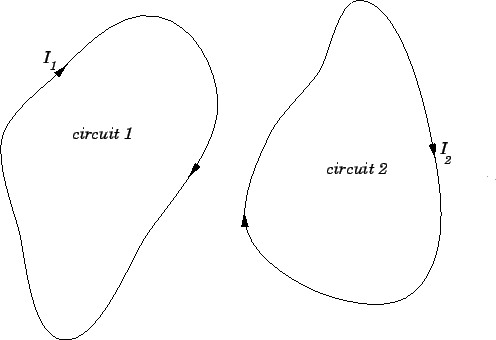 Note that there is no direct physical coupling between the two circuits. The coupling is due entirely to the magnetic field generated by the currents flowing around the circuits. As described previously, is a geometric quantity depending on the dimensions of the core, and the manner in which the two wires are wound around the core, but not on the actual currents flowing through the wires.